Hoozin was always known for its innovative approach on collaboration. By working on a community based approach, the productivity and adoption becomes tangible. Clearly, knowledge management can only become real with a community based solution. But Hoozin has always had a vision on Digital Workplace. Overtime Hoozin wanted to connect all Digital Assets into one single experience for the end user. This Digital Workplace would need to be entirely user centric and not IT centric. This means we would need to prefer ‘high adoptive tools’ over ‘what we already have’. Only by aiming at adoption can one achieve the ultimate goal: increased productivity and happier employees. What problems are out there for the common Digital worker? Imagine the Digital worker of today… massive amounts of inbound information, scattered over different applications, source files and ID’s. Every app or Business process gets perceived as a hurdle to take. Information comes in disordered and a sense of growing stress is perpetual at the end user. This is a real problem for most modern Digital workers. Not to mention that new processes and tools are thrown at them from ‘above’, assuming they will all love it. What we need is a real easy to use solution, allowing profile management, social stream, collaboration through communities while the landing page consist of a consolidated landscape of widgets that represent all relevant apps for the Digital user. These widgets ‘compress’ all inbound information, emails, alerts, requests, into one single Dashboard. Finally a control tower where all info is available at a glance. No more need to log into different screens and ‘fetch’ information. How would that work technically? 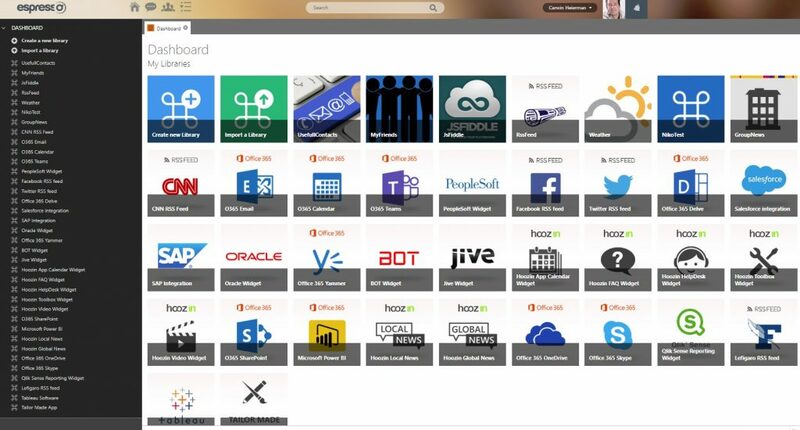 Hoozin has a next generation Widget Builder that allows building (or deploying standard ones) Widgets. These Widgets are the building blocks of the Hoozin Digital Workplace. Hoozin will take care of the design, the content to surface and the back end DevOpps part. 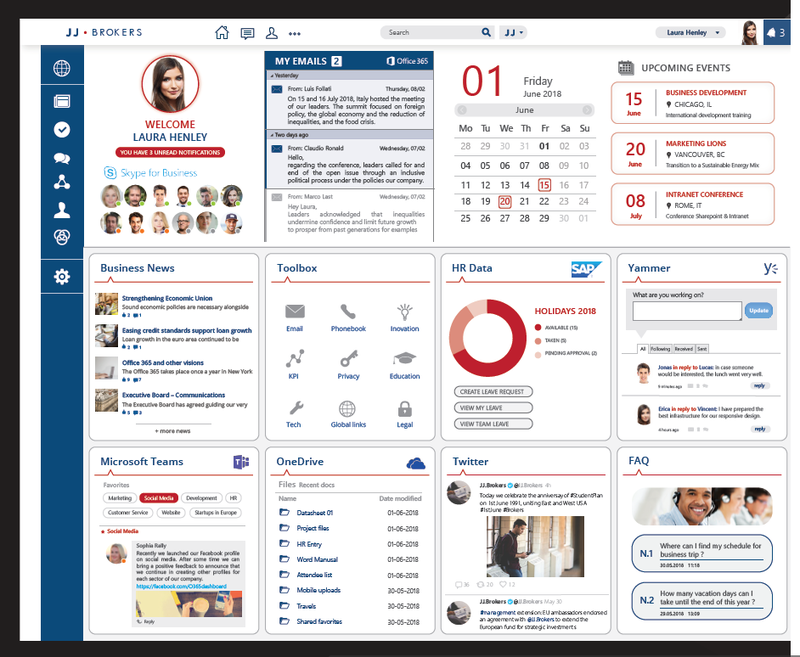 These widgets are all web responsive, produce ‘critical’ information, tasks or reports in a live mode. They also serve as links for further actions by the end user. Of course, SSO and API calls are all required in this process. Just ‘tiles’ without a collaboration engine is missing the point. Only collaboration and communities would also be missing the point. The vision is to combine day to day collaboration with the inbound information of the regular end users application landscape. Hoozin wants to solve the problem of Office 365 adoption, not by putting a ‘de-ugly’ coat on top, but by advertising the right Office 365 asset to the right user when they need it. We are fully focused on end user requirements versus ‘a need to use what we have’. Being end user centric, in the end, allows better adoption of your tools and investments. Hoozin is of course a Social Intranet ‘out of the box’, so all the ‘voice of the company’ requirements are easily covered, especially with our CMS system. The Digital Workplace requirements get covered by our smart and cost effective Widget Builder. What’s nice to know, is that the widgets are not under any license agreement. So consume as much Digital Integration as you want! The Hoozin Widgets are easy to try. Some are standard, like our Hoozin Application Widgets. But also the Office 365 Widgets are fully standard. 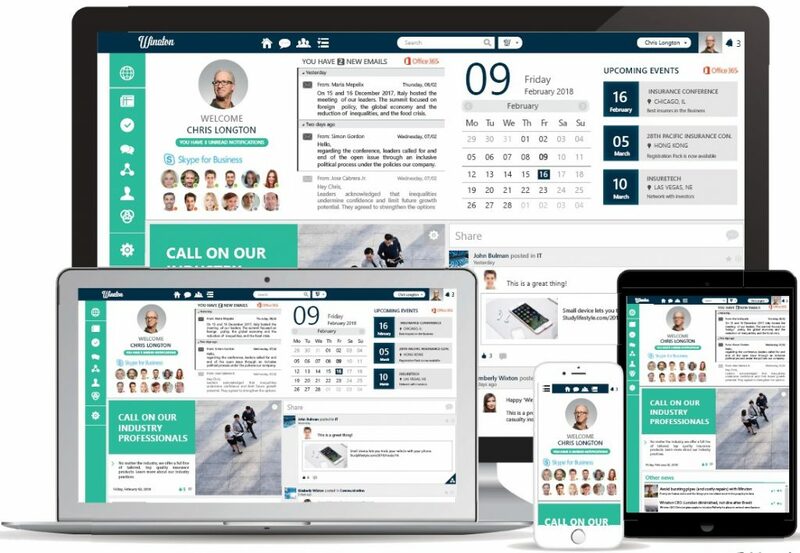 The Hoozin Digital Workplace is fully web responsive, integrates with Office 365 and covers all the requirements of a classical Social and Collaborative Intranet. Follow us on twitter for more up to date news and our events. Don’t just fix a problem. Disrupt!